Luftgekühlt is a big thing in Los Angeles, a cult show for air-cooled Porsches only. It's grown quickly, from 'underground' to mainstream, switching between highly unusual venues – this year's Luftgekühlt 5 was at a lumber yard. And now it's visited the UK, the first time there's been a Luftgekühlt outside of the USA. After weeks of UK heatwave, it was disappointing and ironic that this LA-born show suffered grey skies and heavy rain – but the turn-out of cars and enthusiasts alike to the Bicester Heritage venue was still impressive. The show was based around the central Motor Transport Yard at Bicester Heritage, where Porsche specialists Sports Purpose is based. 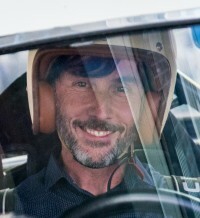 Indeed it was Sports Purpose that worked closely with Luftgekühlt founders Patrick Long (a two-time Le Mans class winner) and creative director Howie Idelson to bring the show to the UK – and Patrick, Howie and collaborator Jeff Zwart flew in to oversee proceedings. As with the LA shows, significant cars were placed strategically around the site, with owners of air-cooled Porsches then invited to park around them. In this way, there was always a surprise: the Björn Waldegård rally 911 parked askew on a grass bank outside one of the old aircraft hangars, a Garrard RSR replica outside the loading bay of what is now the Classic Oils HQ, a John Fitzpatrick Kremer 911 on the main driveway, a Jagermeister 911 next to the storage sheds, and the wonderful Scuderia Flipietti 904 GTS awaiting discovery in a quiet courtyard between workshops. One of the three black 964 RSs artfully lined up outside a hangar turned out to be a subtly modified creation for LA's Workshop 5001, looked after by boss Marlon Goldberg, who had flown in especially. Historika parked one of its race cars in the AutoClassics car park, to be joined by several other pre-73 911s, including a wonderfully tatty but original Targa, with Paul Stephens' neatly modded examples across the way. Outside Porsche Classic Life the line-up include the stripey Paul Smith Design 911, and Jayesh Patel moved his distinctive RUF between a number of locations for maximum photographic effect. Outside and opposite the gatehouse were two gatherings of early 356s, and at the other end of the site a neat line-up of 914s helped emphasise the point that this wasn't just about 911s. In fact, a Porsche tractor really emphasised that point outside the Pendine showroom... In the public car park, water-cooled Porsches were allowed their own display area – but definitely not allowed into the show itself. Back in the Motor Transport Yard, where Auto Wax Works and the Wriggly Monkey Brewery kept hunger and thirst at bay, even the outlaw 356 was outshone by Michael Way's famous 550 RS, its orange wing at spectator shoulder height in the Sports Purpose showroom.